Mom's Gone Bronson! : Mrs Renfro's for ALL Your Holiday Snacking AND Cooking!! + GIVEAWAY!! Mrs Renfro's for ALL Your Holiday Snacking AND Cooking!! + GIVEAWAY!! If you are having a party this holiday season then PLEASE throw in some of Mrs. Renfro's Salsa or Sauces! They are so amazingly divine that I can't even begin to tell you how much I enjoy them! I have always had a spicy tooth and so the hotter the better and these sauces are all right up my alley! I especially loved the Chipotle Nacho Cheese Sauce, which was wonderful as a center dip with chips,veggies and breads, plus it is nice on top of a pasta dish if eating a pasta salad and then the BBQ sauce was great with chicken and hot food as a side to dip or to smother! I'm not usually a big fan of peach but the Peach Salsa had a nice tang to it and I actually used half of the jar in some cooking when making a tomato based recipe and I just wanted to see what it would taste like - I don't think salsa is just for dipping and you can certainly combine it with anything you like to give it a shush of flavor! Now, the Mango Habanero hardly got a look-in with anyone else in my house as it was my favourite of the bunch and it is so hot and spicy that I couldn't resist it at all! I tried it on toast, with veggies, as a side, on some cooked chicken, you name it I thought I would try it out and it worked on EVERYTHING! It has the right amount of kick that I love and I just can't go wrong with it! There is not a bad thing to say about these Salsas and Sauces, they are well thought out and the flavors are a match made for my tastebuds! The best thing about all of these Salsas and Sauces is that they are GLUTEN FREE! The Salsas are also fat-free and you can find these both in your regular grocery store! Nacho Cheese Sauces are available in Medium, Chipotle and Ghost Pepper, which I am dying to try! There are recipes, right on the label of each jar, which makes you able to try something new, when you pick up a different jar! 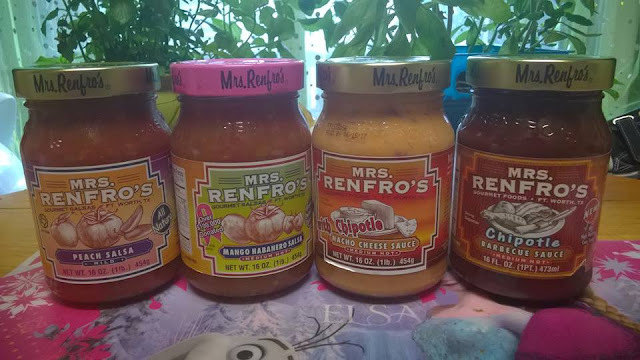 Mrs Renfro's sauces, salsas and cheese sauces have a little something for every taste and I am sure they will have something for you, even if you like yours on the milder side! Mrs Renfro's would LOVE for you to get a taste of their salsas and sauces, too and are offering TWO prizes of TWO jars each of any Mrs Renfro's products of your choice! The TWO winners will be chosen within 24 hours of giveaway end and will be expected to confirm their prize within 48 hours! IF no winner is confirmed within that time, the prize becomes forfeit and a new winner is chosen until we have 2 confirmed winners! Enter the rafflecopter, below! - Good Luck! You can find Mrs Renfro's products AND recipes over at the website, here, and you can stay up to date with their social media accounts like Facebook AND Twitter! Enjoy fueling those taste buds! I think I would choose the garlic salsa and the mild salsa. Some of these sound very interesting!